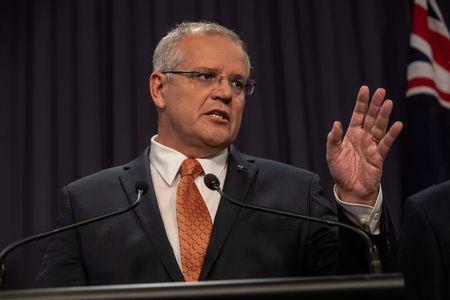 SYDNEY (Reuters) - Prime Minister Scott Morrison's Liberal Party faces a tight election contest in Australia's largest state on Saturday, polls suggest, as a strong economy and a troubled opposition may not surmount voter anger over the removal of his predecessor. Morrison, who replaced Malcolm Turnbull after a backbench revolt last year, is pinning his re-election hopes for a May federal poll on his conservative government's economic track record, a strategy it has also deployed in New South Wales. The outcome in a state that has historically swung between the two major parties and is home to some marginal electorates that Morrison's party must win to secure re-election will be a pointer to the May result. "You can't escape the parallels between New South Wales and the federal election," said Haydon Manning, a political science specialist at Flinders University in South Australia. "If the Liberal Party can't retain government there, the odds of a Labor victory in May will be much shorter." Australia's robust economy would be the envy of politicians heading into a poll in other countries, but the state's finances are in even better shape, with unemployment near a record low, below the national figure of 4.9 percent. State coffers topped A$400 billion (£216 billion) last year, exceeding the economies of each of the southeast Asian nations of Malaysia, the Philippines and Thailand, despite signs of a property price-led pullback. Yet the economic strength has not translated into strong polling for the state and federal Liberal parties. Voter frustration that the strong economy has yet to deliver better infrastructure has dented support for NSW Liberal leader Gladys Berejiklian, analysts said. "The infrastructure cycle hasn't matched the electoral one," said Rodney Smith, an expert in Australian politics at the University of Sydney. "Berejiklian has not been able to cut enough ribbons to make people think she has delivered." Despite a #MeToo scandal that has rocked the opposition Labor Party, its support has grown steadily in recent months amid rising discontent over inequality. "It will be close," Berejiklian told reporters in Sydney. "We need to finish the projects we've started, we need to begin the new ones." Less than two months before the federal election, Morrison's government is trailing Labor by 54 percent to 46 percent on a two-party preferred basis, amid voter anger at the removal of his predecessor. "There is a lot of anger at the change in prime minister," said John Warhurst, a specialist in Australian politics at the Australian National University. "The state election will provide a litmus test for Morrison's appeal in Sydney's west, where there are a few seats that incumbent Liberal members hold with only a small majority."